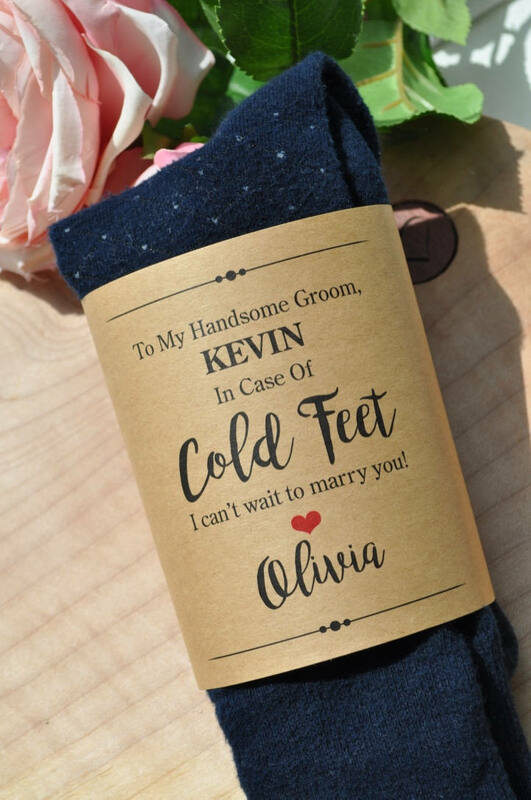 Surprise your Groom with a little gift to ease the wedding day jitters with this “In Case of Cold Feet” personalized sock wrap label. Your choice of Kraft cardstock or White cardstock. Size is 4.25″ x 11″. Simply wrap around your socks and tape in back. (Socks NOT included). This turned out great! And also arrived very quickly! Thanks! it look great and cannot wait to give it to my soon to be husband! This came out so perfect and cute! 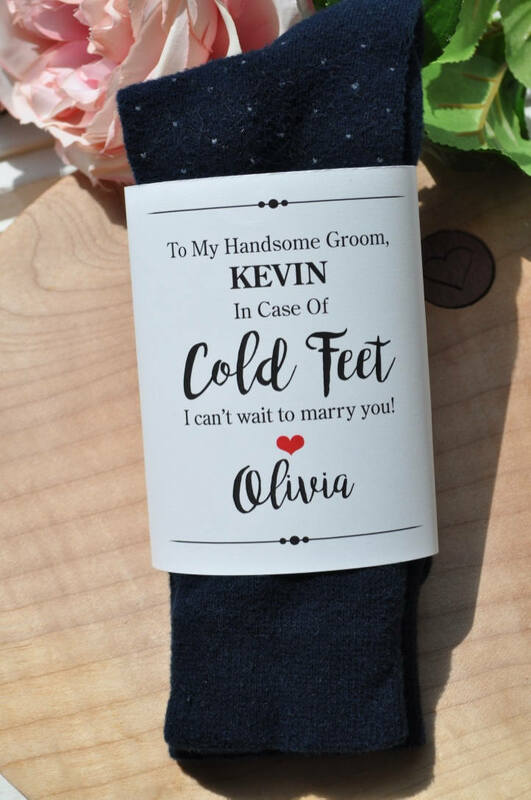 I love how I can put it on any pair of socks that will match his outfit for our big day. It's perfect!! And arrived extremely fast!! Thank you so much! Love it and can't wait to surprise my future Hubby!! Shipped very quickly! Looks exactly as pictured. Super duper fast shipping and exactly like the picture! Adorable! Good quality and fast shipping! It's perfect! Exactly as it looked and shipped in pristine condition! 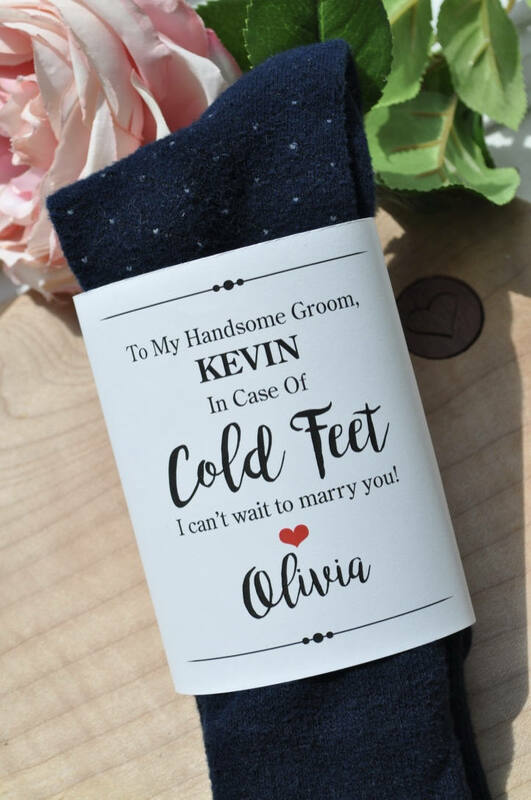 I cant wait to give this to my soon to be husband with some cute socks! Quick shipping and I think the item looks even better in person than it does in the photos!!! I would definitely recommend 🙂 Thank you! Did not come in time. When it did come it was nice quality, but unfortunately it just got thrown away since it arrived after the wedding. Excellent quality. Quick delivery. Can't wait to leave for my groom as he gets ready on our wedding day. So very please with the product and seller. She went above and beyond expectations! Highly recommend! This was such a cute surprise for my groom on our wedding day. He assured me he didn't have cold feet but wore the socks anyway! 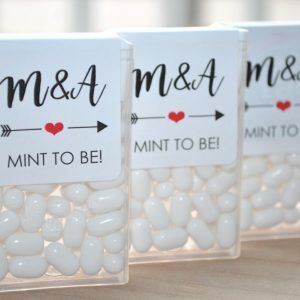 These were so perfect for a little something to give my husband at our rehearsal dinner. The funny thing is.. he got me slippers in case of “cold feet” the same night!! Very fast shipping and great customer service. I would definitely recommend shopping here! Super Fast Shipping, great quality product. Awesome customer service. Just so perfect!!! Shipping was fast and the wrap was even nicer in person! Adorable! My father, stepfather, and groom loved these! I also liked that I could purchase this item and buy the socks separately. 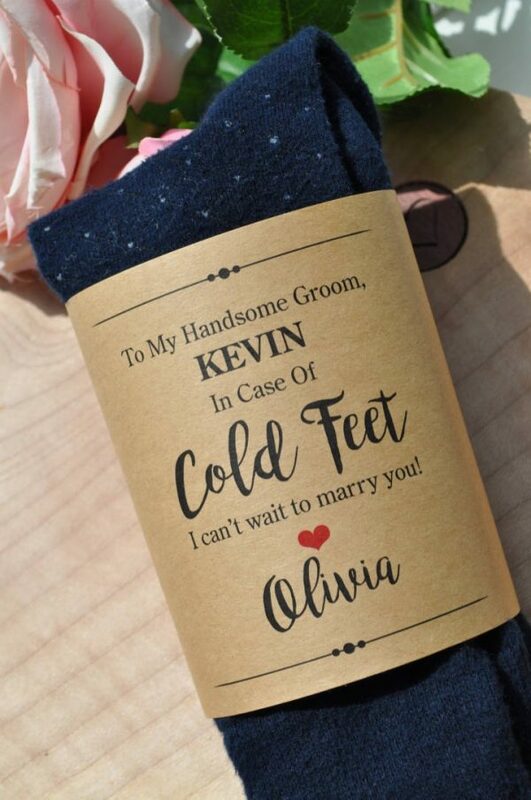 This also works great if your wedding party is renting a tux where socks are included. I just had my Mom and Stepmom place this around the included dress socks with the FOB tuxes. 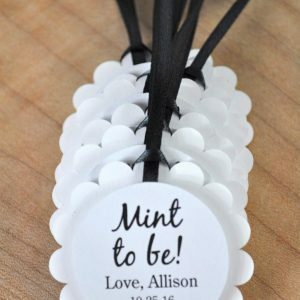 These are so nice and will add the perfect touch to our groomsman gifts! Very well done and just what I expected. Super cute can't wait to give to my soon to be husband. So I ordered these on a Saturday afternoon and they arrived to me on Monday. I was so surprised how fast they arrived and they’re perfect! Turned out perfect! Thank you for great service! Shipped quickly. Very excited to give this to my groom on our wedding day. My groom loved it! Thank you! Absolutely adorable! Can’t wait to give them to my Groom-to-be!! This item was just what I was looking for. And quick delivery. I am excited the give this to my Future Husband! Love it! 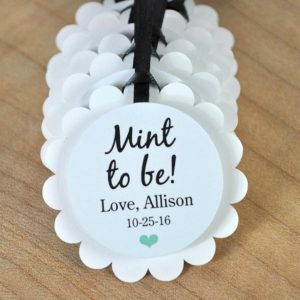 It’s so cute and will make for a cute joke on the wedding day. I'm so glad I bought this!!! It's perfect!!!! Exactly as pictured and arrived very fast. Top quality! Beautifully printed! I received my order so quickly and nicely packaged. Thank you so much – I am very pleased!! This is short and simple – PERFECT! Shipping was fast. Thank you so much!!! Delivered promptly and packaged well. I haven’t used it yet but it looks great. Can’t wait to see his expression! Perfect!! Exactly what I was looking for. Natalie was very easy to work with and very understanding. Would definitely recommend her and her shop. Thank you!! Love this! But there’s no way to tape/stick it so that you can wrap it around the socks so I’ll have to use super glue or something! Other than that it’s super cute! Very cute idea to pack in his bag serving as a gentle reminder!!! 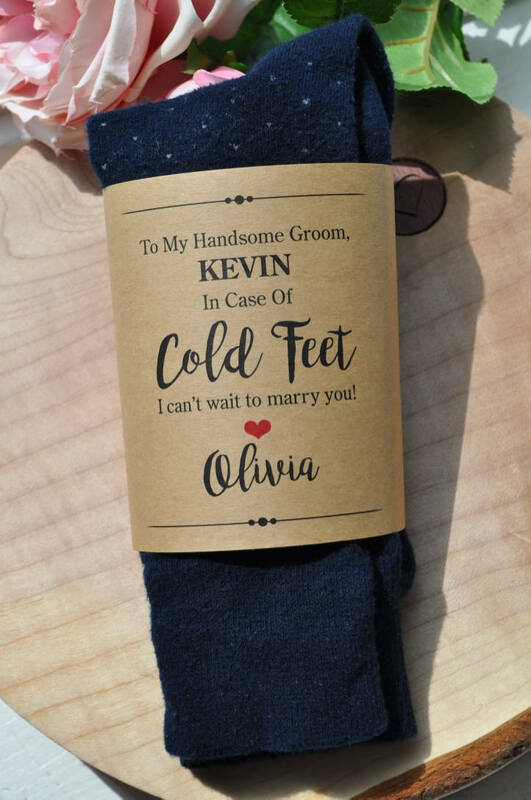 This will be the perfect little gift for my groom! Thank you I can’t wait until my soon to be husband sees this on our wedding day it’s so perfect! Very cute! My dad and future husband will love the personalization! 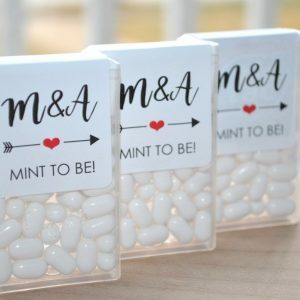 This was a simple and perfect little something to give my husband on our wedding day and it shipped super quickly! I was a little bummed that this item didn’t have socks included. I ordered an other sock item and and it came with socks. Now I have to go shopping without him. That’s hard since when we shop we are together. Natalie was quick to respond and vey helpful. Product came out exactly as described. I had to add double sided tape to hold the wrap together and it worked well. My groom loved his surprise gift the day before our wedding! Love it. 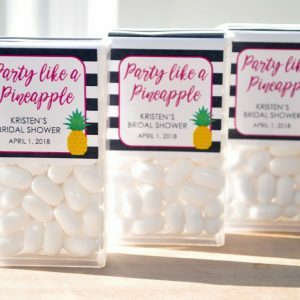 SoSweetPartyShop did a great job on this! It’s perfect. I can’t wait for the socks to arrive. He’s going to be so surprised!! It’s perfect and came super fast! I didn’t realize this didn’t include the socks. I just paid $8 for a piece of paper. Super cute!! He thought it was a good idea! This was a perfect choice for my fiancé who is always cold!! Can’t wait to give to him for one of his wedding gifts! Beautiful label, perfect for my groom gift! My package was lost in the mail, and they sent me another one immediately! It got here in time for my wedding and I love it! Great customer service!! Loved it. Exactly as pictured, he love it and it was exactly as I pictured it. Service was timely and it was a great value. Thank you so much. This came out so cute and it makes for a perfect little gift! !